Priyanka Gandhi Vadra joined active politics two weeks ago. Congress general secretary Priyanka Gandhi Vadra on Monday unveiled her official Twitter handle, drawing thousands of followers within the first few minutes. The launch of her social media presence came on the same day as her mega roadshow in Lucknow, marking her first visit to Uttar Pradesh after being given charge of the eastern half of the state for the upcoming national elections. Her decision to join active politics last month, after years of maintaining a low profile, sent a wave of excitement among Congress supporters. Since then, she has gradually stepped up her public appearances that have culminated in Monday’s closely-watched rally. Priyanka Gandhi’s joining Twitter was announced on the micro-blogging website by the Congress at 11:49 am on Monday. Within 15 minutes, her follower count had crossed 5,000 and 25,000 in the first hour. Though she hadn’t posted a tweet, she had followed seven people including her brother and party chief Rahul Gandhi. Party leaders Jyotiraditya Scindia, Randeep Singh Surjewala, Ahmed Patel, Ashok Gehlot, Sachin Pilot and the Congress’s official account were the other six. The Congress and its top leadership has upped its game on social media in the past few months after years of trailing the ruling BJP which has cultivated a strong support base online for years, helping Prime Minister Narendra Modi score a huge win 2014 elections. Political observers have noted marked difference in Congress chief Rahul Gandhi’s Twitter presence where he has doggedly attacked Prime Minister Narendra Modi and shared more of his engagements, including trips overseas and vacations. 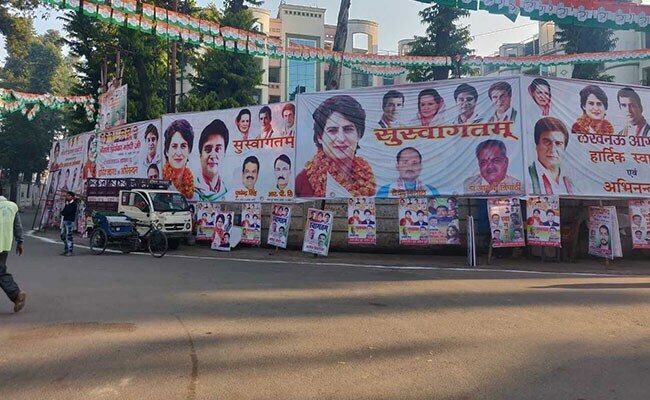 The Congress has put up thousands of posters for Priyanka Gandhi Vadra’s roadshow in Lucknow. For the upcoming elections, the Congress is trying to build an opposition alliance against the BJP, which faces charges of a job crisis and a weak farm economy. Priyanka Gandhi Vadra, 47, has campaigned for the Congress party in previous elections to help her brother, but largely stayed in the wings, letting her brother fully take the mantle of the Nehru-Gandhi family that ruled India for most of its post-independence era.